We’ve slashed all of our prices to get you out of the cold with our Autumn 2014 Sale! 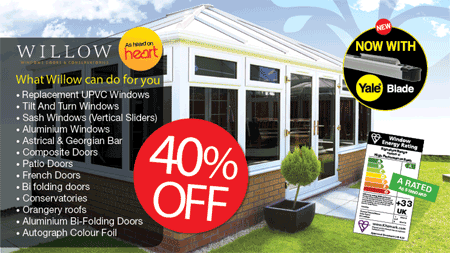 Imagine no matter what your project is, new window replacement, new conservatory, replacing the front door or upgrading your entire property with 40% Off All Double-Glazing and uPVC Windows, Door and Conservatory Products, this is the best time to make it happen before Winter sets in! Willow windows are not only stylish; they are manufactured with high quality materials to ensure they maintain their good looks and function efficiently for many years to come. Whether yours is a modern dwelling or period home, our Double Glazing windows will enhance the appearance and complement the architectural integrity.To find out more about our fantastic range of windows please contact us at 01245 363060 or via our Web Enquiry Form. Whether you are looking for uPVC, Aluminium, Composite or Bi-Folding Doors “Willow Windows” will provide you the highest quality doors available in the UK. All of our doors are provided by Signature-Windows, one of the leading suppliers in the UK.To find out more about our fantastic range of doors please contact us at 01245 363060 or via our Web Enquiry Form. Our conservatory systems provide you with a robust and virtually maintenance free home extension. Our Signature Range of Conservatories is designed to suit you, your existing home and your lifestyle now and in the future. Utilising our Autograph Colouring Scheme you have a wide variety of colour texture options, giving you the opportunity to create a space in your home, which is totally unique, based upon your personal needs. To find out more about our fantastic range of conservatories please contact us at 01245 363060 or via our Web Enquiry Form Web Enquiry Form. An orangery is very similar to a conservatory or a greenhouse, but contains a lot more brickwork than the majority of other designs and styles available on the marketplace. The brickwork is designed to look as if it has always been a part of your house, with large windows and doors installed as well as a glass roof. Signature Orangeries are perfect if you want a home extension that looks as if it were part of the original building. Please view our galleries to get an idea of the design of the orangery and see how it would attach to your house as if it were always there. To find out more about our fantastic range of orangeries please contact us at 01245 363060 or via our Web Enquiry Form.